Sydney Shop Girl: Show Tunes Friday. Life's Candy (But Not For Tori) and the Sun's A Ball of Butter. Show Tunes Friday. Life's Candy (But Not For Tori) and the Sun's A Ball of Butter. All those months of watching and loving Glee have finally paid off. It's Friday and the weather's bleak. There's only one way to make it better and that's through song. Over to the cast of Glee to transform those lyrics with their uplifting vocal harmonies. You don't really want to hear me try to sing. I took the music (in my head) with me to run my errands last night as I tried valiantly to not allow any rain on my parade to the nail spa. At the carpark with dry feet!! Thongs - Cotton On, bag - Witchery. 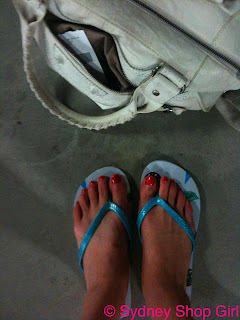 Beach coloured thongs, a white hand bag and the dry concrete of the underground carpark. That's almost the full complement for a Southern Hemisphere Christmas. For the sake of completeness, I returned to the car some hours later with OPI's 'A Ruby for Rudolph' on my toes. 'Life's candy...' A perfectly ironic perfect segue into what's on my Kindle at the moment. Tori Spelling. Whose life really wasn't quite Candy (Spelling). At the risk of sounding gushy, I loved Stori Telling and Mommywood. I started reading Stori Telling after catching episodes of Tori & Dean on Foxtel. Tori grew on me. She came across as someone with a genuine sense of humour and ability to relate to all kinds of people. She gave good reality TV. Surprise, surprise - Tori Spelling as an author is a completely different person to Donna from 90210 1.0 and also from what I assumed she would be like from my comprehensive review of her media coverage. She writes with humour, self analysis and intelligence. She's a story teller (or should that be s(Tori) teller). It's like reading the back story to all the paparazzi phots I've ever seen of her (and believe me, I've seens quite a few) with the added bonus of her insights into raising her children (Mommywood) and the difficult relationships she has had with ex boyfriends and her mother (Stori Telling). There are two sides to every story but I think Tori manages to keep any bitterness and resentment she may be feeling in check and really does make a good attempt to be objective in her writing. I know everyone has an agenda with their writing and I don't pretend (or really need to know) Tori's reasons for writing her books. All I know is that I enjoyed reading, laughed with her and felt greatly relieved that I really didn't miss out on not having the lavish childhood she had. As Tori emphasizes, it has been the people in her life that have made it all the richer, not her possessions. Perfect for reading over the Christmas / New Year break. I bit of Hollywood escapism with a real world edge. I'm just getting started on the final book, Unchartered Terri(Tori) and I'm beginning to feel sad already that there won't be another Tori book waiting for me at the end of it. The bathers! I need to report back about my Victoria's Secret order. First impressions. I think they were well priced. The fabric is a good weight with proper lining and the finish is great. The tops aren't so obviously padded that they'd act as safety beacons out at sea, but they do give a significant (without crossing over to the ridiculous) boost (I had to put that word in here somewhere) to the wearer's beach body confidence. The padding is removable. Each set worked out to be about $95 inclusive of express shipping. As a price comparison, I was looking around at Seafolly and similar brands where cup size specific tops are at least $100 on their own with bottoms around $70. Victoria's Secret push up triangle top and mid scoop bottom. The triangle top has a wide strap with a solid metal clasp. The mid scoop bottoms give good coverage and come up to just below the waist on me. Victoria's Secret push up tankini top and scoop bottom. The tankini top (regular length) sits around the waist. I'm 167cm tall for reference. There is a longer length too. The shoulder straps are adjustable. The scoop bottom comes up lower than the mid scoop but we're still not in the danger zone / plumber's crack territory! Okay, I haven't yet tested them in the water but I'm pretty confident there won't be any wardrobe malfunctions. I just need some sun, even if it is a ball of butter. Show tunes, where would we be without them? I think red toe nails are a Christmas must have. I am now off to purchase Tori on my Kindle. Thanks for the suggestion.